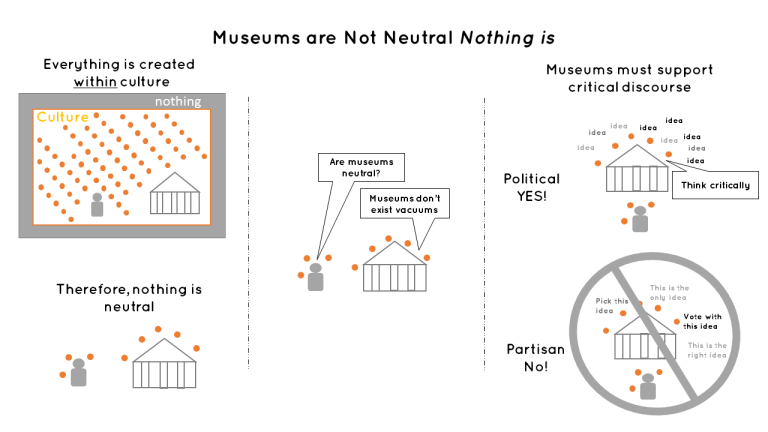 Are Museums Neutral? Or are they Neutered? In the former definition, the car is static. Anyone who has put a car in neutral when on a hill without the parking break can attest to the fact that momentum is a possibility. The neutral vehicle is in a state when motion is no longer solely the choice of the driver. Your actions are still choices. The car is the apt metaphor for considering museums and neutrality. When museums don’t acknowledge that they make choices, they are not freed from making decisions. For example, if when planning an exhibition of American history, if you decide to remain canonical, you are making a choice. Any history is based on decision and interpretation. When you present that history, you are supporting those decisions. You might not see those decisions. You might believe those ideas to be facts, but assuredly, other facts have been left out. If you want to go with the classic two-sides to every story argument, history is full of sides. If you don’t think so, you are working with your eyes closed. Even if your eyes are closed and you claim to be neutral, your actions are still choices. To return to the definitions of neutrality, the nation-state sense of neutrality can also be an edifying metaphor. Switzerland was famously neutral during World War II. The tiny mountainous nation was surrounded by Axis states, so they were on an ideal flight path for the Allies in their quest to vanquish the Nazis. Yet, Switzerland had a strict no-fly-zone in effect. Allied planes were impounded in Switzerland. So, while the Swiss didn’t fight on either side, they made it hard for the Allies to fight against the Axis. In effect, their “neutral” action was still making a choice; they chose to allow a government, who massacred millions of innocent people, to continue to do so. Let’s bring the nation-state metaphor back to the museum sphere. There are points when history is incredibly, egregiously horrendous, like the Holocaust. But, there are other moments, when the depravity of humanity is effaced by other social victories. American history is full of examples. Consider again about mounting a comprehensive installation about American history from above. You need to make choices. If you are choosing between George Washington and his neighbor Jasper, you will choose our first president, certainly. Square footage costs dollars. But, other choices are harder. What about choosing to discuss if Washington had slaves? Omitting a mention of his slaves is a choice. You might think you are doing this to remain neutral and avoid the issue of race. But, what you are doing is supporting an America that doesn’t acknowledge slavery. Museums have a long history of sanitizing installations with the victors earning the spoils of history. But the act of removing elements of history is attempting to divorce collections from politics. Simplifying history will almost always sway towards those in power. 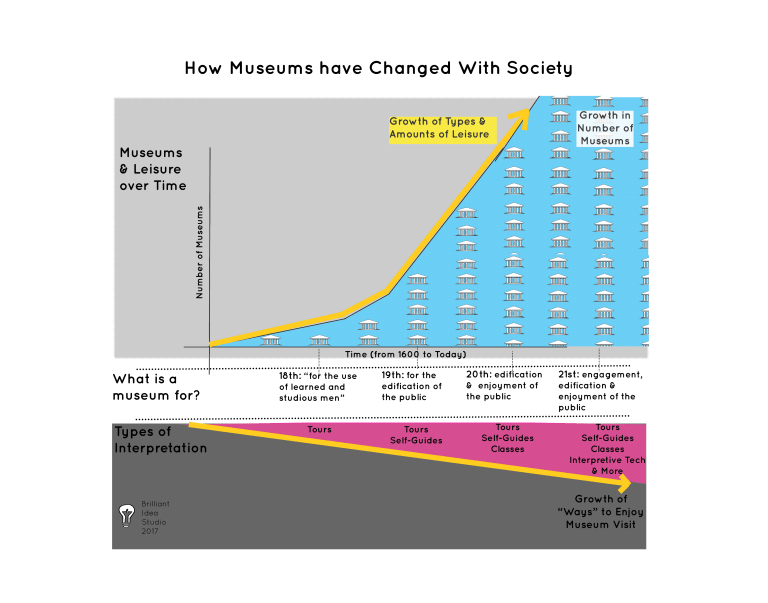 Museums are, at their core, social institutions; if not, they would be repositories. Collections are held in care for people. In galleries, material culture becomes social education. The question then becomes what education is offered in the museum galleries? There is great responsibility in this decision — and great power. Power and museums have a relationship like peanut butter and jelly. Power and museums have a relationship like peanut butter and jelly. When combined, they are hard to separate. In many ways, this is why the issue of neutrality is so hard. Museums have been able to support power subtly under the guise of neutrality and devoid of politics. The aversion to “Museums are Not Neutral” from the field is in part because as a field we have fooled ourselves. We made political decisions when we placed non-Western collections “in context” which European collections in pristine white galleries. And, we made different choices when we moved those same collections into pristine galleries. Art museums aren’t the only one making political choices. Science museums have long shown prehistoric objects, taking a stance on evolution. Every moment of collecting, installing, and interpreting is a moment when you make a choice. What you exclude says as much as what you include. Finally, there is no getting away from politics. Everything in our culture is socially constructed. When you think you can be neutral, you are missing the natural biases in society. This can be extremely dangerous. You can inadvertently make choices that make your installations more partisan. Return to your installation about George Washington. Without it, you are clearly taking a side, which is that slavery, and the people associated with it, isn’t worth discussing. If you acknowledge slavery in the installation, you are opening yourself to share your institutional interpretation. This will be challenging, no doubt. It’s hard for many people to see slave owners as good people making bad choices. It’s equally hard for some people to see George Washington as a slave owner. By remaining blind to bias, we are doing our field and our visitors a disservice. Here is the crux of the neutrality issue. Bringing up complexity in the museum is hard. We often neuter narratives in order to maintain our veneer of neutrality. Our visitors are often not well-versed enough to notice what has been omitted, and as such they are getting partisan information. By remaining blind to bias, we are doing our field and our visitors a disservice.